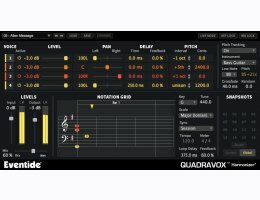 Quadravox is a unique composition tool designed to inspire songwriting, stack harmonies, widen instruments and offers creative innovative rhythmic sequences. With Quadravox, you can take any incoming tones, including drums, and generate up to four voices based on the chosen key and timing interval. It’s optimized for multiple instances so your tracks can interact with each other by way of beautiful harmonies and groovy sequences. Quadravox controls are intuitive, allowing you to quickly adjust parameters or type in values. Each of the four voices can be independently manipulated by level, panning, delay time with feedback, and pitch, including the type of musical interval. The effect can even be sync’d to your DAW tempo for killer, melodic, rhythmic delays. Unique Notation Grid presents pitches on a traditional music staff with a quantized grid for placing notes over time allowing for a more musical programming experience. Color and brightness indicate pan and level for each voice. Eventide uses PACE’s ilok.com licensing system, with or without and iLok hard- ware dongle, to license their plug-in products. Each license provides two activations which can reside on either your computer or on an iLok license dongle.